We’re very excited to be back on the airwaves in Central Florida! The group behind the clashes is Right Sector, the strike force of the U.S.-backed coup that overthrew Ukraine’s government. The death toll in Odessa stands at 42 people killed, most of them burned to death or suffocated by smoke inhalation in the inferno at the Trade Unions House. There is no dispute over who were the victims and who were their killers. The victims were pro-Russian protesters who had occupied the building. The attackers who set fire to it with petrol bombs were members of Right Sector, the ultra-Nationalist strike force of the U.S.-backed coup that overthrew the elected government of Ukraine in February. Right Sector leader Dmytro Yarosh told Newsweek on March 19th that the Western-backed coup regime in Kiev has organized Right Sector militia members into new paramilitary forces for a “war” to “cleanse the country” of pro-Russian protesters. So it is not clear whether the militiamen responsible for the mass murder in Odessa were in fact newly recruited Ukrainian “National Guard” troops or just “civilian” Right Sector thugs, nor whether they were locals from Odessa or forces sent in from Kiev, Lviv or elsewhere in Western Ukraine. For Americans, a more serious question hangs over Ukraine’s Waco in Odessa and indeed over the entire U.S. role in the crisis in Ukraine. The earliest media reports of Right Sector’s existence date only from January 2014 as it took charge of the protests in Kiev, and the earliest article on Right Sector’s web site dates from November 25th 2013. Right Sector was created less than six months ago, as the U.S. State Department and the CIA was already laying the groundwork for the coup in Ukraine. So what role has the U.S. played in the recruiting, training and direction of this group that now has so much blood on its hands? Dmytro Yarosh, Right Sector’s leader, joined the Stepan Bandera All-Ukrainian Tryzub (Trident) paramilitary organization in 1994. He became the head of the militia in 2005. Like the neo-Nazi Svoboda Party, one of three parties in the coup government, Tryzub drew inspiration from the World War II-era Ukrainian leader Stepan Bandera and his Organization of Ukrainian Nationalists, who massacred tens of thousands of Poles and Jews during World War II and supported German campaigns that killed many more. Despite his early collaboration with the Nazis, Bandera soon fell foul of the German occupiers in Ukraine and spent most of the war in the Zellenbau prison for political prisoners at Sachsenhausen concentration camp. Like his hero, Yarosh speaks fiercely of Ukrainian independence from both Russia and the West, although most of his venom is directed at Russia and Russians in Ukraine. As in Syria and throughout the world, the violent, dangerous forces the U.S. recruited and deployed to overthrow Ukraine’s government are not entirely under U.S. control but are more easily directed toward violence and chaos than toward any constructive purpose. NATO leaders formally declared in Bucharest on April 3rd 2008 that Ukraine and Georgia “will become members of NATO.” U.S. coup manager Victoria Nuland flew back from Kiev to tell the National Press Club in Washington on December 13th 2013 that the U.S. had spent $5 billion to “help Ukraine,” and that it had not spent all that money for nothing. Then Mrs. Kagan flew back to Kiev to oversee the transition from the recruitment and movement building phase of the coup to the unleashing of Right Sector street violence in the Hrushevskoho Street riots in Kiev on January 19th. As America’s angel of death flew back and forth across the Atlantic in taxpayer-funded comfort, the 42 victims of Ukraine’s Waco in Odessa were living their lives and minding their own business, with no inkling of the unfolding scheme that would lead to their horrific deaths. Routinely omitted from the Western propaganda narrative on Ukraine is the fact that Russia has had a reasonable proposal for the future of Ukraine on the table all along, since before the emergence of Right Sector, before the coup in Kiev and before Russia reclaimed Crimea in response to the coup. Russia’s proposal is for a neutral and federal Ukraine. NATO leaders would abandon their plans to absorb Ukraine into NATO, and the different regions of Ukraine would be granted greater autonomy under a new federal constitution. This offers the hope of ending the back-and-forth all-or-nothing power struggle that has turned the people of Ukraine into pawns of Russian- and Western-backed oligarchs and their foreign allies since 1991. The main obstacle to the Russian proposal is its reasonableness. It’s really the only sensible framework for a solution to the crisis. But the U.S., its NATO allies and the coup government in Kiev have staked out extreme positions, calling pro-Russian Ukrainians “terrorists”, threatening them with military force and blaming Russia for everything. This makes it difficult for the U.S. and its allies to accept Russia’s proposal without very obviously and publicly backing down. However, if Right Sector leaders and the coup government are still getting very different advice and direction from their CIA case officers at the U.S. Embassy in Kiev, none of this will work and we can expect further escalation, more Right Sector atrocities and the rising danger of an unthinkable war between the U.S. and Russia. It will be no comfort to recognize that none of that had to happen. 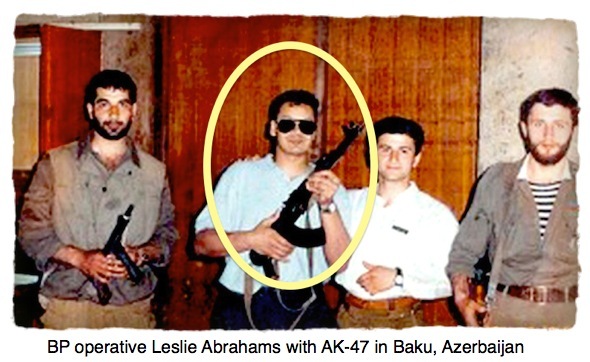 The BP executive was explaining to me how the CIA, MI6 and British Petroleum engineered a coup d’état, overthrowing an elected president of a nation who was “not favorable to BP.” The corporation’s former Vice-President, Leslie Abrahams, is pictured here, holding an AK-47 in front of BP headquarters in Baku, Azerbaijan. Like most of the other BP executives I spoke with, he proudly added that while he was working for BP, he was also an operative for MI6, British intelligence. Earlier this month, the Obama Administration officially OK’d BP’s right to resume drillingin the Gulf of Mexico. 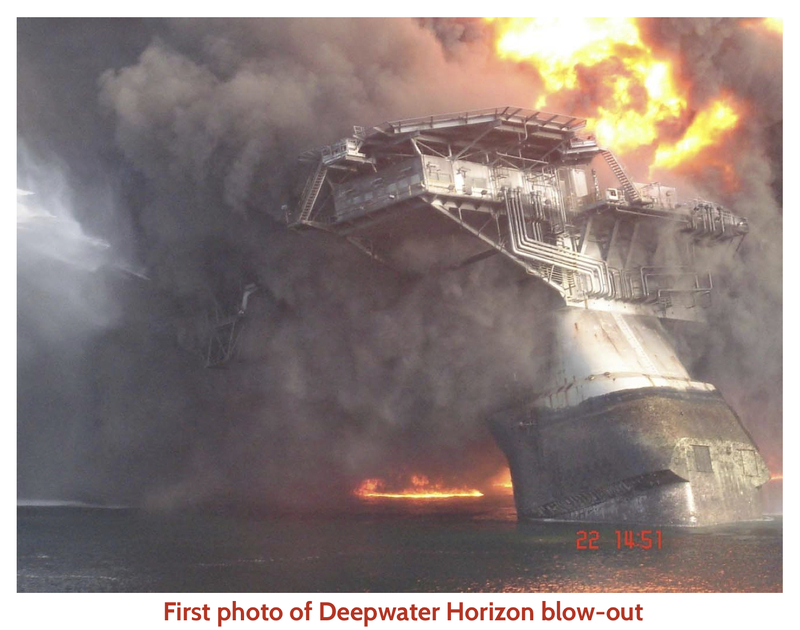 And two weeks ago, just to assure the company that all is forgiven, the U.S. Department of the Interior gave BP a new contract to drill in the Gulf of Mexico––right next to where the Deepwater Horizon went down. At the same time, the forgive-and-forget U.S. Justice Department has put the trial of David Rainey, the only BP big-shot charged with a felony crime in the disaster, on indefinite hold. To understand what really happened in the Gulf of Mexico, and how BP became a corporate creature beyond the reach of the law, British television network Channel 4 sent me on a four-continent investigation through a labyrinthine funhouse of bribery, lap-dancing, beatings, Wikileaks, a coup d’état, arrests and oil-state terror. BP Chairman Lord Browne flew into Baku as soon as the young state elected its first president. Former British Prime Minister Margaret Thatcher joined him via the “Iron Lady,” a plane the corporation outfitted especially for her. At a state dinner, Browne handed BP Vice-President Abrahams a briefcase and showed him the contents: a check for $30 million. Browne then gave the check to the president of Azerbaijan. Still, the new president remained “not favorable” to BP’s demand for control of the Caspian oil, so MI6, the CIA and the corporation went into action. The spy agencies armed and empowered the former Soviet KGB chief Heydar Aliyev, who in 1993 overthrew Azerbaijan’s elected government. Once he became dictator, Aliyev named himself president for life and within four months signed a no-bid deal to give the reserves to BP. BP and MI6 man Abrahams was instructed, he told me, to “smooth the way” for the deal by taking Azeri officials to London in Lord Browne’s jet for weekends of lap-dancing and other entertainment. By Abraham’s own estimation, he paid over $3 million in additional cash bribes to make certain BP would have no trouble. I should note that Abrahams broke no law: bribery by a British subject was legal then. BP did not deny the pay-offs when I questioned them directly, and MI6 officers proudly confirmed the coup d’état’s purpose of locking in the offshore deal for BP. What does this have to do with the blow out of the Deepwater Horizon? This: It is now well established that the disaster occurred when the cement used to cap the well failed, allowing explosive methane gas to fill the rig and transform it into a sinking fire ball. But this was not BP’s first cement failure and explosion. Just 17 months earlier, BP’s Caspian Sea Transocean rig suffered exactly the same fate. The cause of the two blow-outs was identical. In the Caspian as in the Gulf, BP laced its cement with nitrogen gas. The nitrogen bubbles sped up the drying of the mixture, saving BP half a million dollars a day on rig rental charges. But in offshore high-pressure zones, nitrogen-spiked cement can fail. And it did. Twice. Question: Why in the world was BP allowed to use this insanely dangerous “quick-dry” cement just after a failure in the Caspian? Answer: A cover-up––via threats, beatings, arrests, bribery, perjury and the complicity of the U.S. State Department. I only learned of the prior blow-out because of a coded message from the Caspian Sea received from one very nervous eye witness. To get the evidence, I flew to Baku and headed across the road-less desert to find more witnesses. How do you keep a monstrous blow-out from going public? As one of the arresting cops told us with odd pride, “BP drives this country.” It drives it with cash. Robert Ebel, former chief of oil analysis for the CIA, estimates that at least $140 million of payments by BP for Azeri oil has gone unaccounted for. Where did it go? Notably, the Aliyev ruling family lives like pashas despite the president’s official salary of $100 a month. Oil worker advocate Mirvari Gahramanli said she was beaten by police for raising questions. In case I doubted it, she showed me photographs of a dozen cops slamming her with long clubs. What’s worse, while I was tossed out of the country (it would have looked bad to throw a TV reporter into a dungeon), my witnesses disappeared. BP’s testimony was a lie. The Caspian rig blew out a year earlier. But the lie was good enough for Congress. Based on Rainey’s assurances, legislators pressured the Department of the Interior to drop objections to plans for drilling in the Gulf’s deep waters. Withholding information from Congress is a felony crime. But Rainey has one heck of a defense: the U.S. State Department was in on the cover-up. Deep in the pile of confidential State Department cables released by one courageous U.S. soldier, Pvt. Bradley (now Chelsea) Manning, we have the notes from a secret meeting between the U.S. 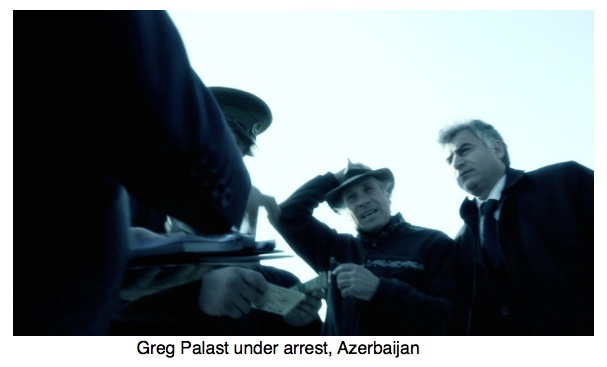 Ambassador to Azerbaijan, Anna Dearse, and the chief of BP’s Caspian operation. In the memo, which you can see in our film, Vultures and Vote Rustlers, the U.S. Ambassador provides the details of the blow-out of the bad cement on the BP rig. The State Department kept schtum, not even warning U.S. safety regulators. And Exxon and Chevron’s chiefs joined BP’s Rainey in the mendacious sales pitch to Congress, testifying, despite their knowledge, that their offshore drilling methods were safe as a game of checkers. Justice is not always abused: David Rainey was indicted for felonious obstruction of Congress. However, the charge centers on a relatively minor falsehood: his alleged understatement of the amount of oil bursting into the Gulf. Neither Rainey nor BP will be tried for the deadlier lie to Congress — the prior blow-out caused by the penny-pinching quick-dry cement — because the U.S. government is itself complicit in the cover-up. And that’s why we are seeing the red carpet rolled out for BP in the Gulf once more. When the U.S. government participates in the corruption of other democracies, when it authorizes bribery and ignores police-state tactics to benefit from business deals, the sins of empire can come back to haunt the nation. In the CIA’s world this is called “blow-back.” What was covered up in Baku has killed Americans in the Gulf, and it will likely continue to kill. And bribery does not simply stay “over there.” American officials are not as different from the Baku bandits as they may like to believe. The agency in charge of regulating BP’s drilling in the Gulf, the U.S. Minerals Mining Service, was rife with watchdogs who, like their Azeri counterparts, took backhanders and pay-outs from BP. And when I say BP was in bed with the regulators, that is not a metaphor: a BP lobbyist was sleeping with a chief of the agency. Don’t bother sending David Rainey a file in a cake: the BP man won’t get two minutes of jail time. His trial has been suspended indefinitely. Immunity from law is not new to BP. As I reported two weeks ago, BP was the main culprit in the disaster caused by the Exxon Valdez grounding. The company walked away without paying a dime to the victims. In the case of the Deepwater Horizon, a few tenacious attorneys have ensured the corporation pays some compensation in the Gulf. But that money comes nowhere close to the damage it caused and will do nothing to harm the company’s bottom line. Today BP has declared Gulf waters clean, as if Mother Nature were just a toilet you can poop in and flush. But I’ve been to the Gulf shores. Dig down ten inches in the shoals off Gulfport and you’ll hit Deepwater Horizon crude. Biologist Rick Steiner tells me BP’s poisonous sludge will remain just under the surface for another 40 year. Hidden––just like BP’s crimes. Watch Palast’s report BP: In Deep Water on Free Speech TV, this Sunday at 7pm & 9pm ET. Check out the trailer here. We know that The US, and especially Republicans including President Reagan and Donald Rumsfeld among others, helped the racist South African Apartheid regime and tried to stop the global movement to dismantle it. But Here are some more ugly facts. At the very least this should make Americans think about their role in defending “freedom” and “liberty” then and, more importantly, NOW. It’s nice to see the inside reports of things we know already. What we should learn from this is how this crap (and worse) is going on today in multiple countries. CIA Confirms Role in 1953 Iran Coup.